If you come to Barcelona this place is a must, be it day or night. In the morning you can sit in the terraces protected in the long shadows of the arcade or under the palm trees. At night trendy bars or night clubs await. You have hostels and restaurants, you have concerts, you have small thieves and police cars. You name it. 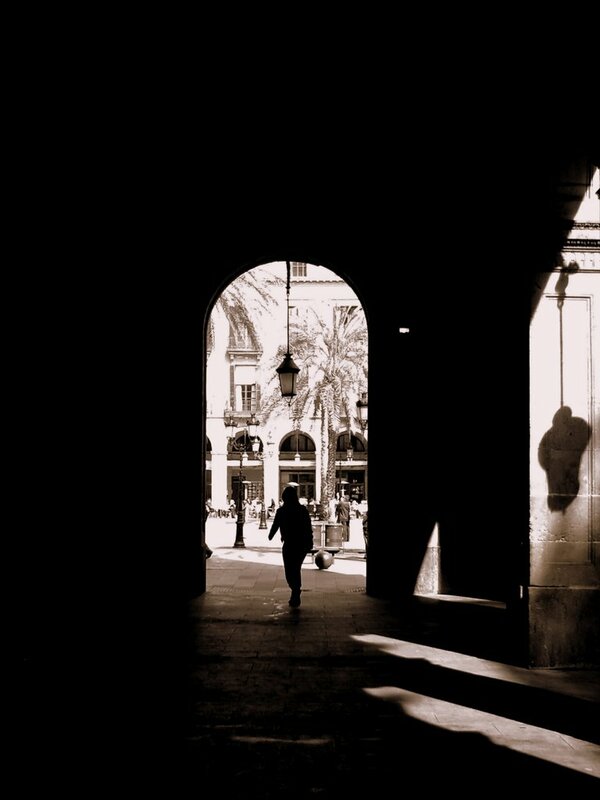 During my many incursions in Las Ramblas I like to hide from the sun and steal some back light pictures like these. I love that shot. A great insight about Plaza Real. A both mysterious and beautiful picture. Congrats! Seems to be a very busy place. Like the way you shot this. Hope the sun shines that fiercely here too. I love your shot and I love Barcelona ! Great and unusual perspective onto Plaza Real. I love how you used the shadows for this really nice effect! "you have small thieves and police cars" - heheh ..
will definitely pay Barcelona a visit :) again, a very well composed image, love the mood! if this is where I think it is, then I agree it's one of the best places to visit in barcelona. i can't remember most of the names of the places I went to. too many siestas and sangrias and cava. Taxidermista, funny as that may sound, is a great restaurant. very nice shot of barcelona! Nice shot Carlos - more thieves and police on the other side of the Ramblas. This is a very interesting Picture. Seeing like through the darkness! Nicely shot!